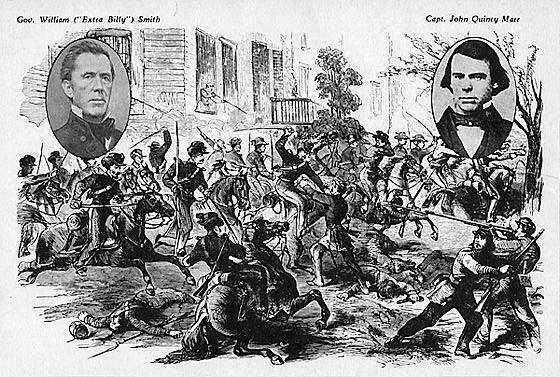 John Quincy Marr and the Skirmish at Fairfax C. H.
Capt. John Quincy Marr of the 17th Va. Infantry, Co. K (Warrenton Rifles) died by enemy fire at Fairfax Court House, Virginia on June 1, 1861. He was the first Confederate officer killed in the war. John Quincy Marr b. Warrenton, Va. 5/27/25. Graduated V. M. I. 1846; Asst. Professor of Math, V. M. I. 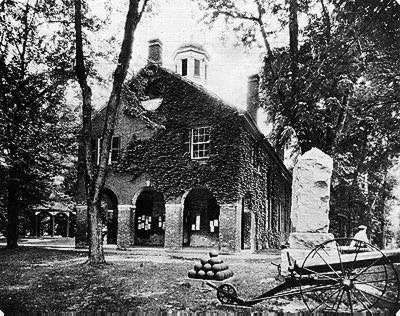 1846 - 47; practiced law at Warrenton; Fauquier Co. Sheriff, 1854; elected Capt., Warrenton Rifles, 11/26/59. 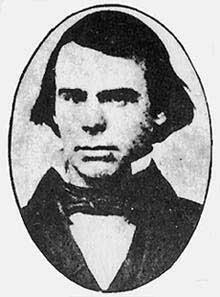 Delegate to 1861 State Convention. Enlisted 4/22/61 at Warrenton; Capt., Warrenton Rifles. Apptd. Lt. Col. of Va. Vols., 5/2/61. Killed 6/1/61, Fairfax C. H. His body was found the next day by "Uncle" Jack Rowe. Buried at Warrenton Cemetery. His uniform shako cap, jacket, epaulets, overcoat and sword are in the collection of the Museum of the Confederacy, Richmond, Va.
With the captain missing, former Virginia governor "Extra Billy" Smith (Dem., 1846 - 1849) led the Warrenton Rifles against the invading northern troops. The period engraving was very exaggerated for Union sympathizers (the portraits were added in this later version). The Marr Monument, erected in 1904 on the Court House grounds, is shown in this photo taken around 1920. It remains there today, as do the two Confederate Navy cannons (pointing north). The cannon balls were removed for safety reasons after even welding them together didn't deter local students from rolling them down Main Street late at night.